Home Shooting Survivors to March Against Violence. Student Survivors of Shooting to March Against Armed Violence in U. S.
The promoters of the initiative announced that children and families will take to the streets of Washington on March 24 to demand’ that their lives and safety become priorities’. WASHINGTON – Students who survived last week’s massive shooting in the U. S. state of Florida are preparing today for a national mobilization called “March for our lives” to demand action against armed violence. Through a page already available on the Internet, the promoters of the initiative announced that children and families will take to the streets of this capital on March 24 to demand’ that their lives and safety become priorities’ and that the massive shootings in schools be stopped. Sister marches are also expected in other cities, according to five students from Marjory Stoneman Douglas High School, where 17 people were killed and 15 wounded on 14 February when an ex-student, Nikolas Cruz, opened fire with an AR-15 assault rifle. People say this is not the time to talk about gun control and we can respect that. This is the moment: March 24, he told ABC Cameron Kasky, who is in his third year at the aforementioned educational institution. In every city we will march together as students who plead for our lives. This isn’t about the Republican Party, it’s not about the Democrats, it’s about adults, we feel careless and, at this point, you’re with us or against us,” he told the network. One of the students who told the U. S. media about the upcoming march was Emma Gonzalez, who made a big impact on social networks over the weekend by spreading her speech during a rally at the Federal Court in Fort Lauderdale. “If the president wants to come to me and tell me that it was a terrible tragedy and that it should never have happened and continue to tell us that nothing will be done about it, I’m going to ask him how much money he received from the National Rifle Association,” she said. 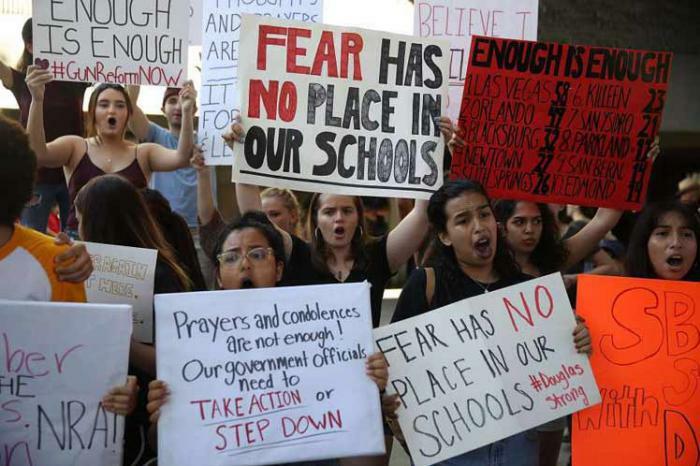 According to the March rally call for mobilization, the action is “created, inspired and led by students across the country who will no longer risk their lives waiting for someone else to take action to stop the epidemic of mass shootings”. In the tragic wake of the 17 lives brutally cut short in Florida, politicians tell us that this is not the time to talk about guns. The March for our lives believes that the time is now,’ the text said. Following the events in high school, Gun Violence Archive noted that during the first six weeks of 2018, 1,816 people died from gun violence in the United States, equivalent to an average of 40 deaths per day. Estudiantes sobrevivientes de tiroteo marcharán contra violencia armada en EE.UU.